People tell me they experience two challenges when trying to meditate regularly. One is finding the time and the second is quieting the mind. The latter challenge can be frustrating and people tell me that their place of meditation has distracting sounds in the background which make it difficult to focus on the inner self. If you are experiencing this, I have a solution that might work for you. There are many ways to quiet the mind from breathing to visualizing and I know many people who like to meditate with music. A consistent noise can also help keep the mind clear. 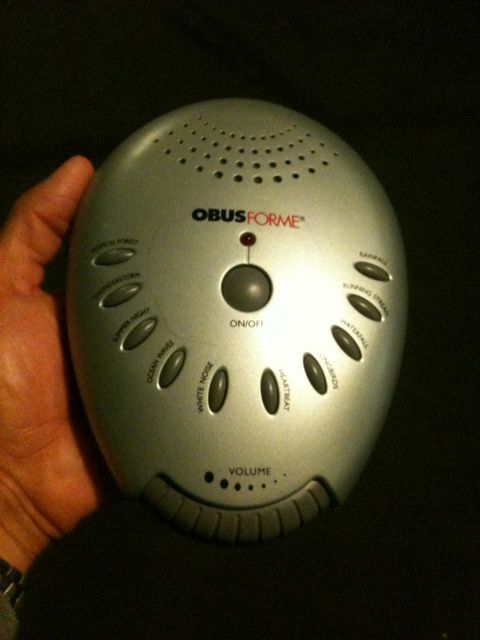 I was recently rummaging in my basement and found a sound maker made by ObusForme. I can’t recall why I originally bought the device, but it has several settings to generate the sound of ocean waves, a rain forest, a stream and other peaceful natural sounds which you can play while you meditate. I have included a picture below and I am sure I have seen these in stores recently. If you can’t find it in stores or on the web, you may also want to try finding music via the web as there are web radio stations that play peaceful music which you can play on your PC, laptop or iPod if you have one. I've used this before and think it's wonderful. Plus, it's free!